Whispering Willow Photo Booth Frames - Contest! I am always surprised to see how many people come to Cool Photo Ideas looking for information on Photo Booth Picture Frames! Apparently these are hugely popular - but ways to display are not always easy! Whispering Willow has the answer! Deborah from Whispering Willow is a true artist and creates stunning stained glass picture frames in a variety of sizes, but its her Photo Booth Picture Frames that we fell in love with! So many styles, designs, colors and even layouts to let you showcase those fun photo booth pictures for everyone to enjoy!¬† She can fit the traditional sized photo booth frame or even the newer wider size as long as you let her know! All her pieces are handcrafted and custom orders are welcome! Deborah has generously offered to giveaway (2) of these fabulous single strip frames to our readers! Want details? See below! Oh, and if you do not want to wait to win one....she is offering Cool Photo Ideas readers a fabulous discount! Use the code "coolphoto" to receive $5.00 off any frame purchase! 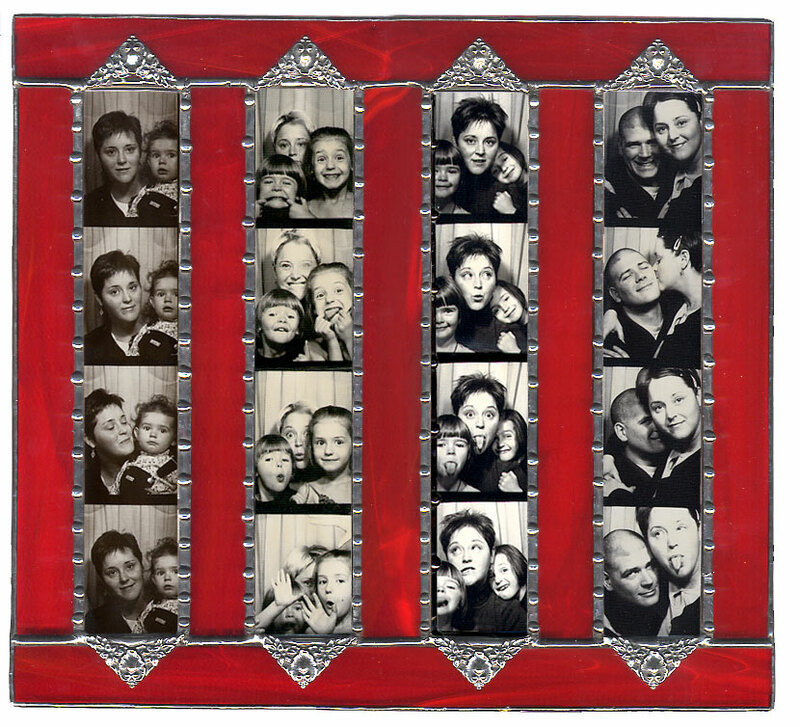 So, you want to win a Whispering Willow photo booth picture frame do you? Well, you have 2 chances to win a SINGLE (one photo booth strip) display frame of YOUR CHOICE, you choose the color and accents! Enter either of the following ways...or enter both ways! 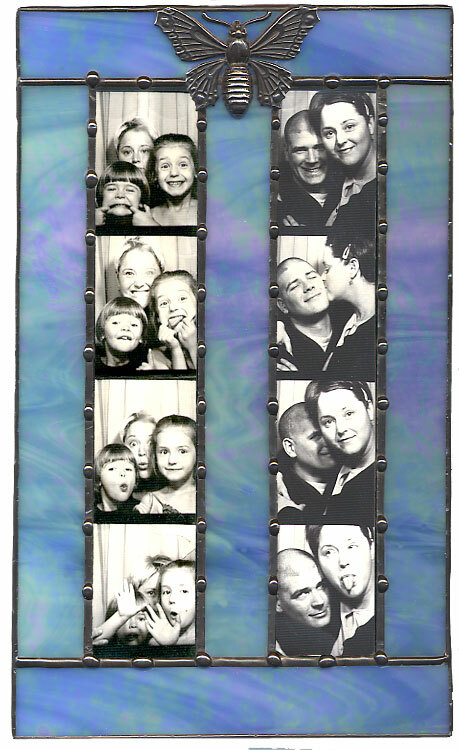 Simply leave your name and email address on this post and tell us what special memory you have in a photo booth! Go to our Facebook Fan Page and add your image to our wall (of course if you are not a Fan, you will need to become one, but hey you love us right - it will be worth the click!)! It would be even more awesome if you can share the story behind the images you post, but that is not necessary! Grab your friends ask them to like your comment - the comment¬† with the most "LIKES" win! And YES - you can enter both to increase your odds of winning! OK, so what if no one uploads an image to our Fan Page, well we will cry, and then - well then we will pick 2 winners from option A....but we would REALLY love to inspire you guys to share your images with others...its a great pick me up as Photo Booth Pictures always have some sort of "special" ability to make us think of happy times...so come on and show us what you got! We know, it takes work....but these frames are REALLY worth it - and think of all the people you will make smile with your 80's hair and 70's tie die! And don't forget the great coupon "coolphoto" where you can get $5.00 off any frame purchase! Coupon is only good through 11/18/09 - so act fast! Deadline to enter: November 15, 2009 at 11:59pm 2 winners will be chosen at random using Random.org and will be posted here by November 16, 2009. Winner has 3 days to claim prize, if no response is received, another winner will be selected.